Have you ever seen such a precious thing? 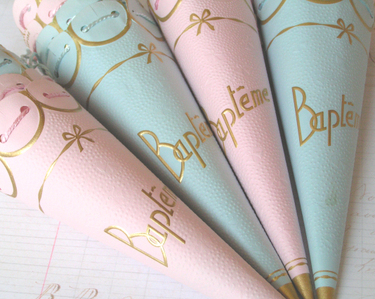 These are vintage (circa 1930's) French favor cones that were used for Baptisms. 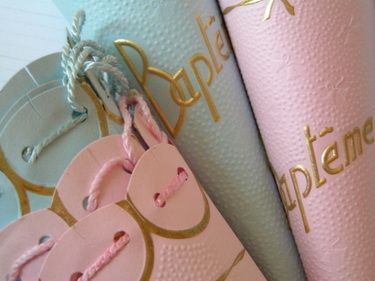 Available in the shop in baby pink and baby blue. I just listed these, and quantities are very limited.....I wish I had more of them! 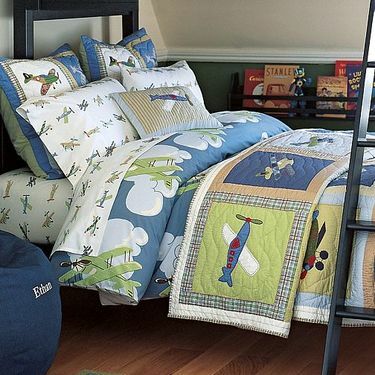 So, we never made it to look at children's bedding yesterday. We ended up cleaning out the nursery (formerly known as the studio) which was still jam packed with books, scrapbooks, photo albums, fabric, a 3-foot pair of angel wings (don't ask....just a crazy idea I had, inspired by a picture in a magazine ages ago. Let's just say, it's not very practical to hang huge wings on the back of your chair. I so wanted it to work!). I have no idea where I'm going to put all of it as I'm already outgrowing my larger new studio. We don't have a basement so storage is always a challenge. Or maybe it's just that I have too much crap stuff. So, anyway, I've got to get moving on the nursery and then on to Mario's new room decor. And then some changes in the playroom. Oh, gosh, I'm tired just thinking about it all. I know I want all vintage themes and am considering this one for Mario's room. He loves planes, helicopters, and anything that flies really. As for the playroom, here is a little corner of it as it looks right now. 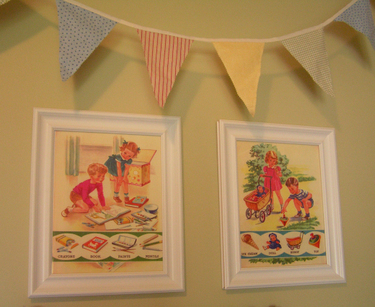 I framed these pages from a vintage children's book and sewed the bunting a couple of years ago. It extends across two walls and makes the room feel fun! 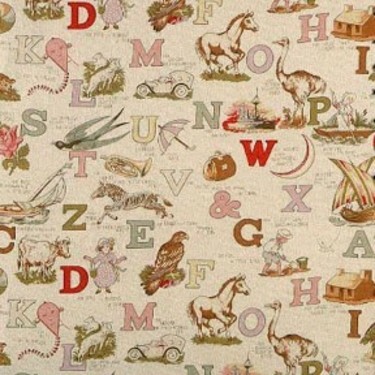 To continue the theme, I just bought several yards of this fabric to make some new curtains for the playroom. Hope to have them done before September. 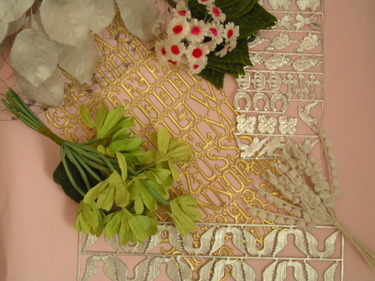 You can get this and lots of other vintage-inspired fabrics here. 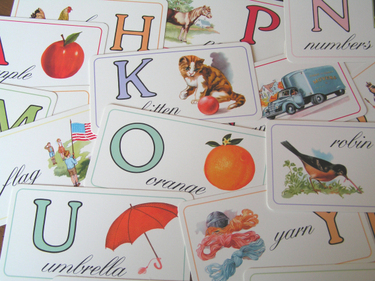 And just look at these flash cards! 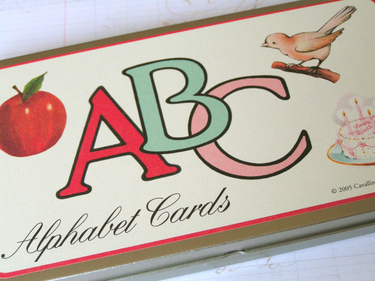 They're from Cavallini & Co., which makes such wonderful paper goods. I have been considering selling some of their fabulous stamp sets and flash cards on onehundredwishes.com, but I haven't decided yet. Aren't the graphics just so sweet? These are going to get hung in the playroom soon. Oh, I love them. 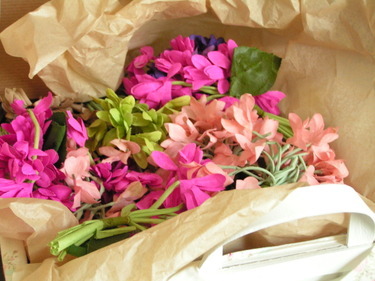 As promised, their are lots of new (vintage) millinery flowers and even some hats listed in the Shop! I also just added new dresden designs including small silver wings, mini pink rosettes, silver assorted whimsies, gold alphabet letters, tiny silver starbursts and new pink and blue borders. Tomorrow we're heading out to look for "big boy" bedding for Mario's room since I need his baby stuff in the new nursey in less than 3 months! Ill let you know what we find. The shelves are restocked! I just got a huge shipment of dresdens, so now you can get those little silver crowns and alphabet sets so many of you emailed me about. There are also more "Cones Full of Wishes" as well as restocked journals, ledger parcels and vintage sheet music parcels. Oh, and lots of silver Lametta tinsel! I'm expecting all three colors of WISH tickets any day now.......will certainly keep you posted on those. Wondering what the picture above is all about? New millinery! They'll be up on the site by Monday....maybe sooner! And they are gorgeous. Hard to part with. Also, for international customers, I have added another shipping option. You can now choose to have your order shipped US Priority International or US First Class International for a lower cost. The choice is yours! Garland of Goodies and a Winner! Well, that was quite a party yesterday! It was fun to see what everyone posted about, all the different tutorials and giveaways that were going on in Blogland. 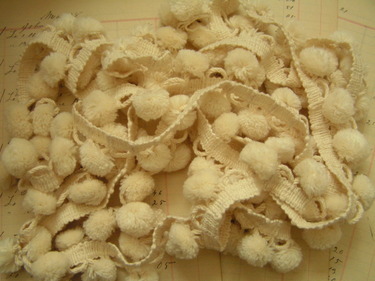 Start with your desired length of large pom pom trim. I got mine in the home dec. dept. of JoAnn's and cut it to a yard and a half. Then, gather all your goodies together. Like anything, it looks more pulled together if you stick with a theme or color palette. In this case, it was vintage and pinks, blues, and creams. 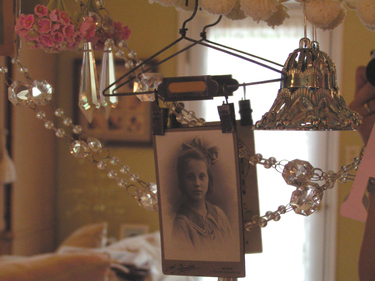 You can use old cabinet cards, jewelry, millnery flowers, initials, ornaments, birds, and whatever else you dream up. 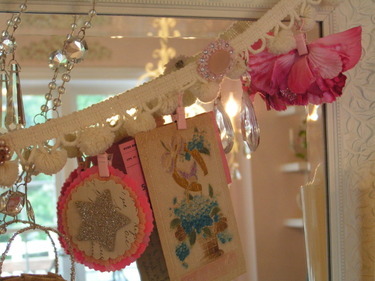 All you have left to do is hang your goodies on the garland. I used several mini metal drapery clips. I was lucky to find a bunch of pink ones a year or two ago. I've never seen them again. You can find off-white, black, brass and silver at Bed, Bath & Beyond or Linens N Things. Use the smallest size you can find. One end is a clip and the other end is a hook with a ring. Remove thre ring and simply hook the hardware through the loop on the pom pom trim and clip your treasure to the other end. 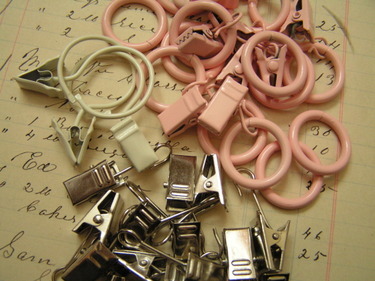 You could also use a ribbon to tie an object on or perhaps an old clip-on earring! There are no rules really. 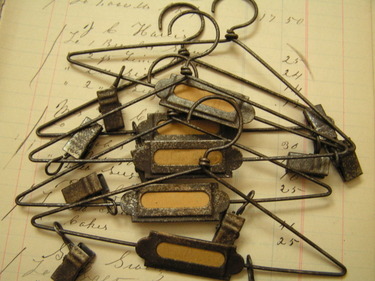 The little metal hangers you see in the picture below were purchased at Character Constructrions. They're the sweetest little things and make a photo look so special! Hope these instructions are clear. Let me know if you have questions. I actually considered selling these in my shop, but they would be pretty pricey once you add up the cost of all of the trinkets. We'll see....maybe some special holiday garlands would be fun. 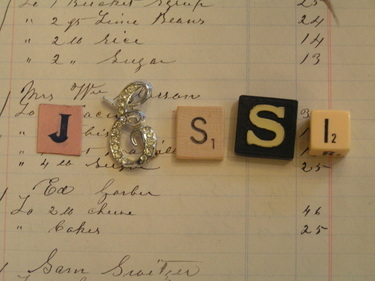 Jessi, I'll send you an email today and get the Garland of Goodies in the mail asap! Congrats! Ok, I'm signing off for today. Tomorrow, I'll post a shop update with restocked items! Finally! As you may know, the premiere issue of Artful Blogging magazine is on newsstands now. To celebrate this wonderful publication, Kari is hosting one of her famous on-line parties! Rumor has it there will be lots of participants. Each participant is supposed to post something related to art. I think many people are posting tutorials, which will be a lot of fun. I always enjoy learning new techniques and tips. Unfortunately, I didn't have time to pull together a tutorial this week, so I'm going to do an artsy giveaway! 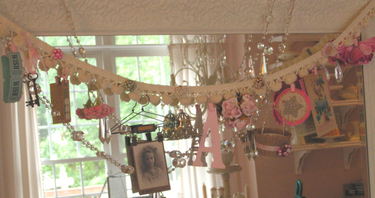 I thought you may like to have a fun pom pom garland with all sorts of objects dangling from it! A Garland of Goodies, if you will. I created this one especially for today's party. I included some WISH tickets, an old skeleton key, a vintage button card, a tiny bouquet of vintage pink flowers, a cabinet card hanging from a small wire hanger, a light blue bell ornament, a monogram (which I'll change to your initial), a bundle of flowers, a bon bon cup, a crepe paper rosette with glitter star, an old postcard, a chandelier crystal, old pieces of jewelry, and a floppy vintage millinery flower. All you have to do is post a comment and your name goes into the drawing. Simple, painless, and fun. I'll be happy to ship internationally too, so don't be shy girls! ok, I'm heading to Kari's blog to see what she's got brewing. Enjoy the party! The 100th Wish was Granted! Hi everyone! Yes, I'm still here....just buried under boxes and tangled in packing tape. I hope to emerge soon and get back to my regular blog posting. My mom was an enormous help this past weekend, and we managed to pack up almost 50 orders. She's just as particular as I am when it comes to wrapping and presentation. Now, George has fine-tuned the skills of measuring out yardage of ribbon and packing up cones! It's really quite cute. I should take a picture. Bear with me if your package is a couple days late....it's coming as quickly as I can pack it up! I stuck this picture in here because I needed a "wish" picture. This is the view I have while I sit here and type this post. 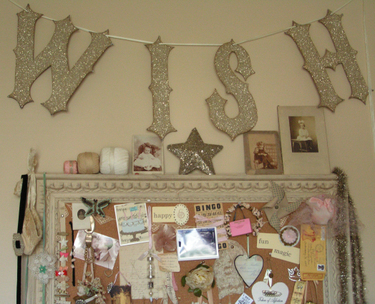 Hanging right above my computer desk are my inspiration board (which I've shown before, but have since added to) and a glittered WISH garland from Wendy Addison. I love this garland, and I am eagerly awaiting Wendy's website. I've been meaning to post this for a few days now, but am just now taking the time to announce it. The 100th order was placed! 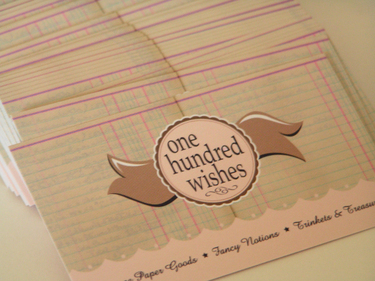 To celebrate, this lucky 100th customer will receive a gift certificate for the shop! The 100th order came from Gina! Congratulations Gina! I'll email you to give you the details. You know I love giveaways, and I plan to do this periodically. It's just fun! In other news, be sure to stop by Kari's blog tomorrow for an Artful Blogging Party! She is the hostess with the mostest as far as blog parties go. I don't know how she does it all. It's sure to be fun though. I'll be participating in some way.....gotta give it some thought today. Ok, I'm off to the OB for my glucose tolerance test. Yuck. I get to drink orange soda and wait an hour for the results........Only 13 weeks to go......yippee! Wow! I don't even know what to say. I am overwhelmed by the response to my shop. Thank you all for your purchases and compliments and support! It's a wonderful feeling to have a successful grand opening, and it wouldn't have happened without all of you. Obviously, I underestimated the volume of business and sold out of many items rather quickly. I assure you I have already reordered every item that is sold out in much larger quantities. 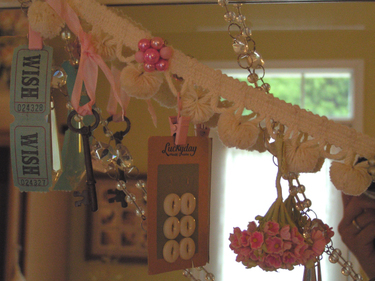 I am starting to replenish my stock of handmade items that are sold out as well. Some of the "sold outs" will be relisted as early as next week. Anyhoo, another thing. I am in the process of adding Standard International Airmail as an alternate shipping option for international customers. This way, you will be able to choose whichever option you prefer. In any case, shipping internationally is not cheap, that's for sure. I hope this standard option will help out! So, this is pretty much going to be my view for a while. I have started packing orders, but have a ton more to do. And I do mean a ton. My mom and dad are coming for the weekend, and I've already enlisted my mom's help. We'll be busy measuring out yardage of ribbons and packing up parcels! I actually enjoy this part quite a lot. I'm into the details. When I get a package in the mail, the presentation is the first thing I notice. I'm just an overly visual person, I think. But, anyway, I hope you like the way your treats arrive! It's a gift to yourself, after all! Whew! I can hardly believe it, but my shop is finally open! It's been a crazy few weeks around here to say the least. 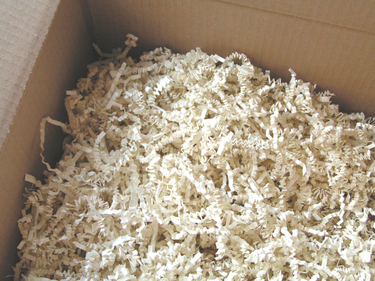 Lots of creating going on and lots of boxes on my doorstep. Too many take-out dinners and late nights on the computer. It's all been worth it, though, and I'm so excited to watch this dream become a reality. I'm sending a big hug and a sincere thank you to all of you dear blog readers who have shown support with your kind comments and emails through this process. I mean that from the bottom of my heart!